Concluding from parts i and ii, this paper details the development of a composite model using Solidworks with the exact shape of a A. minus hook and with a single degree of freedom as per the bract of the A. minus from which these hooks arise. The aim is to produce a model for a probablistic friction fastener that does not destroy the substrate and is reusable, specified by the characteristics of a natural mechanism. The resulting model is suggested as a fundamental to the family of parts, which are fields of hook shaped attachments and therefore potentially manufactured en masse. Design factors for the fastener are identified and adhered to in specifying the morphology for the model. Scaling factors relating to size and relative morphology are expected to be incorporated into the behaviour of the model. The final model is bioinspired and biomimetic and it is derived from a hook of size of 200 microns in hook span. Keywords: modular, stress, miniaturisation, cellulose, chitin, hook, self-assembly, shape-scaling effects, biomimetic, bio-inspire, probabilistic, friction, fields. and  describe the discovery of a shape/size-scaling effect, namely acting upon the span of the cellulose A. minus hook and they describe an investigation into shape acquisition for the purposes of reverse engineering a model of a cellulose A. minus hook and two front leg chitin tarsal structures (those of Omocestus viridulus and Apis mellifera) accurately so as to retain or emphasize their scaling effects. A new method of morphological study was utilised, namely confocal microscopy, suitable for any small structure of biomaterials cellulose or chitin (see ‎). These methods vary in terms of hardware requirements and this has implications on cost, versatility and memory storage. This method of data acquisition of the entire shape precludes the necessity for examination for such things as logarithmic spirals in the growth patterns as all the data is stored in binary. Three specimens’ data were recorded as .tif files, two stacks of two chitin specimens and one stack for the cellulose specimen, each stack featuring hooked attachment structures for study for the purposes of this research grant. The theoretical loading analysis of the A. minus hook under static loading was provided in  indicating that these cellulose hooks are prone to failure in tension due to induced shear and that they exhibited a scaling effect to be stronger than theoretical Newtonian mechanics predicts for a sufficiently small span. Further the capture of the tarsal morphologies in the form of cubic voxels leads to the possibility of using the virtual reality for studying interactions of their attachment in 3-dimenions with plant surfaces and their efficacy under the influence of genetic modification or insecticides. In this paper the model for A.minus is concentrated upon as having further bio-design indicators beyond those selected by the velcro inventor George de Mestral. When considering the system of the hook-shaped structure, going back to the Cambrian Era, one is struck by the fact that there is no apparent control system. Natural Laws prevail. The first hooks shapes appearing on the fossil record were of primitive cellulose and chitin. When studying a biological specimen the prescribed ethos is to study it’s interaction within its system since it is the system that is of interest to a biologist and to a designer. The entire system needs to be considered, of a frictional fastener such as the probabilistic (i.e. non-random) fastener which the hooks A.minus form, and how the fastener shall be designed is based upon the performance of these hooks and their substrates. In the case of the growth and formation of hook-shapes in Nature, their biochemistry will be of equal importance and must have been fundamental to the very first organisms that appeared with shapes of biomaterial. It is possible to break up a system into discrete segments or sections and this enables the identification of bio-indicators such as scaling effects. A free-body diagram is such an example and is selected and constructed along subjective lines for the purposes of force analysis. A free body diagram can enclose an entire system or can be used to analyse part thereof. Considering the 3 specimens of probabilistic fasteners we have examined in part ii, we have to understand that it is not a requirement to reproduce all states of hooking for the purposes of the scientific endeavour. It is the right and correct way to see if it is possible to find one that fits the current pattern of progress first, including forming the material. Without considering forming the material into shape we have a misnomer of trying to make something that cannot be manufactured. The first thing that needs to be done is to find the correct material from which to manufacture these small hooks and that is in itself a difficult thing to do scientifically when so much of the work and progress has gone on behind the closed doors of the laboratory where it has not yet been written up as a success or failure. It is suggested that the approach is to start with a soft material and see if it hardens with correct balance to the surface finish so the coefficient of friction between two organs remains at its most efficient and is not allowed to venture into the realm of a glue. It is furthermore understood that it is a chemical reaction that must be noted down and completed, not a dry mixture of substances such that already exist in the public domain of knowledge. Of the four cellulose-hooked species studied by Gorb and the extra species, A.minus of part 1 , three of the species (C. lutetiana, G. aperine, A. eupatoria) are the weakest in tension and they originate from trichomal structures. From Devlin ‎, trichome is a collective noun for all types of outgrowths supported by the cell wall of the epidermal layer. The epidermis is the outermost layer of cells in a plant and its functions include manufacturing the structural material of the plant. A trichome is a plant hair and can be glandular and non-glandular, cellular, multi-cellular, branched or unbranched. Of these three species, G. aperine exhibits a multi-degree of freedom due to, from Gorb ‎, a hollow base. The other two species arise from the surface of the mericarp. A.minus and G.urbanum, have hooks that originate from the bract and carpel of the fruit respectively and exhibit the strongest contact separation forces. Both have a single degree of freedom due to their origination from a flattened structure. Of the two chitin-based attachment mechanisms we have selected, namely Omocestus viridulus and Apis mellifera, there are two sorts of solutions that avail themselves of our need and that is to try and get them both to obey the same laws as the cellulose hooks do, namely size, shape, material properties and friction. There have been a number of studies of beetle locomotion that measure the detachment force to remove said beetle from a plate spinning round but these do not affect the issue with regards to the effect of the new millennium on the size of the hook – in other words – modern technology has made this sort of measurement seem unfit for consensus of opinion with regards to how to achieve this, that is, a new form of attachment that does not hook but does stick. Elastic Modulus and degree of anisotropy in the material behavior (percentage and orientation fibre). We are driven towards this solution by the tactics laid down by Nature in its growth and form of its natural solutions to the problem of a frictional fastener of the order of 200-micron size in span. That is, the solution cannot be separated from the method of manufacture. Biomaterials are limited in number but we can say that a hook formed in the shape of an A. minus hook with the accuracy as per the single-phase confocal microscope image, from a complex biomaterial such as may be formed by a nano/micro self-assembly, like nacre, will display scaling effects no matter what the biomaterial. The size/shape-scaling effect is not independent of Young’s modulus however, nor is friction. We can also say that it is these scaling effects that we wish to measure and manufacture/enhance so as to tap the hook’s reserve of non-linear behavior that lends competitive advantage. Considering the type of attachment required and its characteristics, we arrive at a state where it is unresolved whether to make a big hook or many small ones with equal value of strength but much the same number of fallow tries to attach, yet less than the big stronger hook which misses everytime. It is at times preferable to make a field of hooks than to make a single one for the purposes of attachment that is not random i.e. probabilistic. There is no restriction from using a dual-hook chitinous tarsal structure in the place of a A. minus hook in model form, however restrictions would be felt at manufacture of these more complex structures. Therefore it is pursued as an exhibit of strength, to pursue the development of a cellulose prong instead of a tarsus with its ancillary characteristics arising from shape, alignment and interaction with other forms of adhesion. To devise a form of structure that maintains the static loading shape and bending characteristics of the cellulose hook of A.minus and yet that does not break and does not require replenishing after every attachment to a substrate that may be fibrous or otherwise. In the pursuit of the .stl file the final conclusion was to make a direct reconstruction of a model in Solidworks. To gather the data 2-D digitizing was applied. Thereafter a model was constructed of a field of hooks that could be rapid prototyped with s suitable device and tested for its features as needed. Using ‎Figure 1 it was possible to digitise two splines for the inner and outer profiles. Diameters were measured perpendicular to the inner spline and used to reconstruct the hook using the loft feature, the result of which is shown below in Figures 2 and 3. The hook and shaft are in proportion. The flattened flange is not. Part (ii) saw the commencement of data gathering concerning the morphology of the hook with the ambition of transferring it to produce a .stl file of the form of the hook. This was unsuccessful however a new simple and clean method of gathering cubic voxels of the shape was discovered This has virtual reality applications. Here. 2-D digitizing is used to transfer the data to a finite element analysis package, where it is assembled into a hook shape with a single degree of freedom of motion delivered by the flattened section or flange at the end of the shaft away from the hook. The structure of an A. minus hook consists of a shaft that emerges from a flattened supporting bract. The flower’s bract itself is rectangular with the hook emerging from one of the narrow edges. This bract has its own permanent attachment to the fruit pedicle at the base. Replicating this bract opens a number of possibilities in terms of hook configurations. See ‎Figure 4 below. It can be said that Solidworks is inadequate for the purpose. It is not capable of analyzing a composite form nor increase the number of materials being analysed at one time. The stress analysis was performed using an add-on of SolidWorks 2004 called CosmosXpress 2000. This package only accommodates isotropic materials and doesn’t contain full details of properties of plastics and composites materials. For the purposes of the exercise the material was chosen to be Acrylic (medium to high impact), a common resin that can be used as a substitute for the purposes of examining the mode of performance of the hook under loading. It was noted from  that, in the fractured hooks, the cellulose microfibrils are all parallel and in alignment with the curvature of the hook. Cellulose is anisotropic in behaviour, absorbing greater tensile stress than compressive stresses. This is fundamental to composite theory. Figures 6, Figure 7, and Figure 8 below show the loading and mode of distortion of the hook in flexing and absorbing the movement of the tip of the hook. It has been noted in the Nachtigal  that hooks in nature are assembled in different configurations and numbers. Gorb compared the mass of the fruit with the contact separation force of single hooks in order to assess the hook performance for each species and the number of hooks required to support the fruit which could be viewed as a measure of design efficiency. This is of course, Nature’s design. Instead this research continues to avail itself of the known thing that is the scaling effect and the fact that a hook with a modular design could help fulfill a number of roles or permutations. Flange shapes i.e. square, rectangular, circular, octagonal etc. Flange attachment mechanisms for both attaching bracts to each other to form composite fields as well as for attachment to a structure needing an attachment mechanism as a sub-structure. Flange shapes also offer the opportunity to manufacture the hooks in flattened rows. The decision to make the flanges hexagonal was an arbitrary one and one that needs testing – it could perhaps be advantageous in manufacturing or performance. The design is hoped to be probabilistic but it is impossible as of yet to produce a model of the scale require using a rapid prototyping device. This means that some of the scaling effects will be lost or be different. The collective effect of the hooks at a small scale in size should be markedly different form that of the arithmetic sum. The desire is a probabilistic fastener that does not interfere with the substrate and able to attach and detach to a variety of them. It will be friction based and in the realm where masses and reactions to them are small compared to the frictional forces generated. It is only in recent months that it has been announced that a byproduct of scanning tunnel electronic microscopy (STEM) has been used to generate shaped of the order of single microns in size and it is hoped that soon a breakthrough in manufacture will occur enabling products generated form natural attachment mechanisms to be mimicked without trouble and studied effectively using a process such as outlined in these three papers. Studies of natural attachment mechanisms have been limited to Nachital and Gorb. Nachtigal grouped the wide range of biological attachment mechanisms according to the mechanism of attachment. A comprehensive review of these indicates that a vast number of these mechanisms are of a range in size of 100’s of microns where scaling effects are felt, at the limits of manufacturing capabilities. The hook is a simple structure but to manufacture it in a controlled fashion to attain one to one correspondence in dimensions and therefore capture the characteristics of the corresponding biological attachment mechanism it mimics is impossible at present. 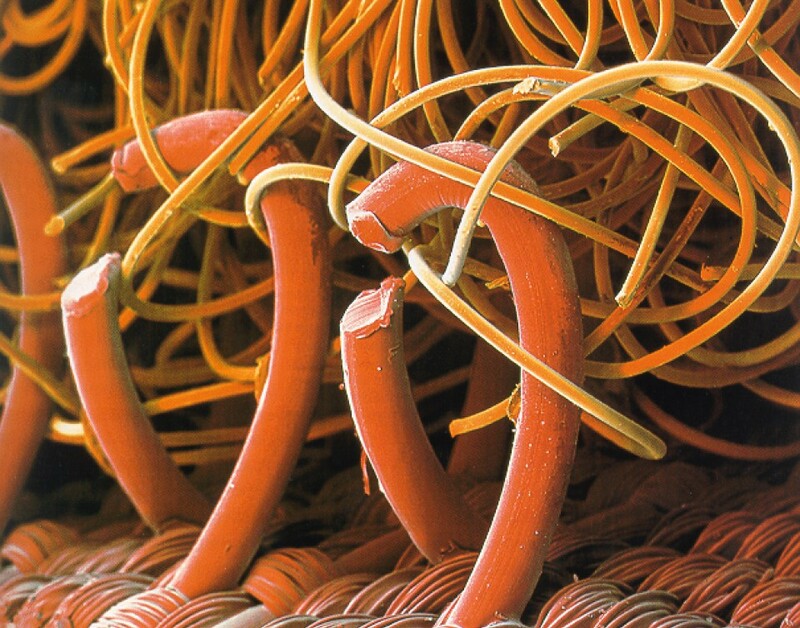 There are three biological materials of which most hooks are composed: keratin, chitin, cellulose. Two of these were present in a form during the Cambrian Age. The biological process of self-assembly has been the subject of much attention latterly, of new biomaterials. From what we have learned in parts (i) and (ii) we have derived a process for gathering data about the attachment mechanism and discovered its properties, its scaling effect, leading us to conclude that at this realm of size the laws governing attachment and its associated forces are not those of current Newtonian Laws. Emperical measurement is necessary to establish the relationships between biological material property, hook span and force of attachment. But it can be established by reason alone that the manufacturing limitations will be high until some form of combination of material and forming is established with suitable efficiency and consistency. It can be assumed that the hook will have some properties that derive from the fact that it is aligned in a field of similar structures. This interaction aids the attachment but hinders the detachment unless fracture occurs. Static modelling has developed to computer aided finite element analysis which is commonplace and it is with this in mind that the research into gathering morphological data in oart (ii), for direct application to a FEA package. In this case a model was produced using Solidworks (2004) of more than a single hook arranged in afield of hooks to model the action of a frictional attachment mechanism. Saunders B., The Biomimetic study of Natural Attachment Mechanisms – Imaging cellulose and chitin part 2, Journal of Robotics and Biomimetics, ???????? Figure 1: Electron micrograph with grid superimposed. Each bar represents an interval of 100 microns. Figure 3: 3-D reconstruction from SolidWorks of a burdock hook and shaft drawn to proportion to incorporate scaling effect. Hook span was approximately 200 microns in reality for the chosen specimen. Figure 4: Front and side views of hook with tapered shaft. Figure 5: Front and side view of hook with added flat hexagonal flange. Figure 6: The applied loading to the tip of the hook (from CosmosXpress 2000). Figure 7: The applied restraints include the tapered bract (from CosmosXpress 2000). Figure 8: The maximum deformation under loading. Figure 9: A zipper-like configuration of sixteen adjoining hooks. Figure 10: The zipper of Figure 9 in profile. Figure 11: The zipper configuration in isometric view.